The Bruxism Association says that morning headaches, facial and ear pain, jaw joint problems and damage to teeth and gums are symptoms of a common dental disorder called tooth grinding, or bruxism. Dr. Deborah Romack and Dr. Garrett Mulkey, Weatherford dentists, diagnose and treat bruxism at Cosmetic and Family Dentistry. They work to make patients more comfortable and to stop adverse dental health effects of bruxism. Bruxism is regularly occurring clenching and grinding of adult and children’s teeth. Often nocturnal, bruxism happens during the day, too. It can be unconscious and is linked to stress and anxiety. This worrisome oral health disorder may be unnoticed by the person who grinds and clenches. Other people in the same room as the patient, particularly spouses, roommates and co-workers, hear the noise. While people of all ages suffer from bruxism, young women under the age of 30 seem most prone. Luckily, most kids outgrow bruxism as they enter the teens. Teeth clenching seems to be a normal part of many children’s oral development. 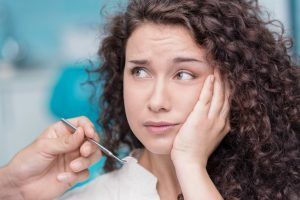 As with adult bruxism, however, teeth grinding requires treatment from your Aledo dentist if symptoms are severe or if tooth enamel or restorations deteriorate. Chipped fillings, loose teeth, and gum damage accompany severe bruxism and need professional attention. Digital x-rays uncover abnormalities as do sophisticated intraoral cameras used by Dr. Romack and Dr. Mulkey. Simple ice and heat and rest, plus employing stress reduction strategies and relaxation exercises , help. Anti-depressants and muscle relaxants may be prescribed. Some doctors and dentists advise limiting alcohol and caffeine. And, of course, smoking cessation helps overall help and may eliminate bruxism. Orthodontics, such as Invisalign clear aligners, address misaligned bites that cause bruxism. The dentist may use dental crowns and fixed bridgework to level uneven teeth. Custom-made acrylic mouthguards cushion bites at night. Covering the top and bottom arches, these guards work best combined with other treatments. The Mayo Clinic states that bruxism frequently accompanies sleep apnea when people snore and stop breathing periodically at night. As with sleep apnea, snore guards help bruxism. Customized to fit the patient’s mouth, a snore guard places the lower jaw in a more forward position and changes bite. This opens the airway, reducing snoring, and eliminating destructive friction. Your Weatherford dentist doesn’t want you to suffer with teeth clenching and grinding. Contact Cosmetic & Family Dentistry. Contact your Aledo dentist today for an appointment. Feel better. by: Dr. Deborah Romack at July 22, 2016 .